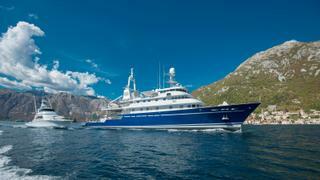 The 66.75 metre support vessel Golden Shadow has been listed for sale by Jan Jaap Minnema at Fraser in Monaco. Designed by Martin Francis, Golden Shadow was built in steel and aluminium by US yard Campbell and delivered in 1995 as the first purpose- designed support vessel with her most recent refit in 2017. Accommodation is for up to 20 guests in 11 cabins comprising two doubles, two singles and seven twin cabins. All cabins have en suite shower facilities while the crew quarters sleep 20 staff aboard this yacht for sale. Golden Shadow can be easily converted into a stand-alone research boat. She is equipped with enough technical facilities to mount scientific surveys deep into unfrequented, unexplored waters. One of her most important features is the stern elevator platform, which has the capacity to lift up to 10 tons and is used to launch and recover tenders, dive boats or a seaplane. It can also be used as a helicopter landing platform. In 2015 she completed a five year around the world mission, surveying coral reefs and ocean habitats across the Pacific and Indian oceans. She is an ideal platform for this, as she can carry and handle many different sized boats and equipment, and has a large diving and underwater operations facility on board. Her top speed is 16.5 knots and she boasts a maximum cruising range of 6,500 nautical miles at 15.5 knots with power coming from twin 2,655hp Deutz-MWM SBV9M628 diesel engines. Lying in Tivat, Montenegro, Golden Shadow is asking €9,950,000.